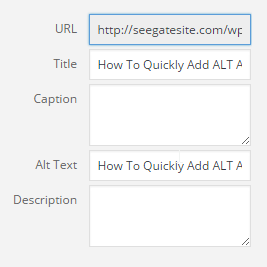 Programming Tutorials – seegatesite will share how to quickly add ALT and title attribute in WordPress image. Images at the article is an important part of the site with rich content, with the image on the article, will make the site more lively and can help us to more easily interact with the visitors of our website. The image is also one way that can be used to getting the traffic, because a lot of traffic coming from search engines through pictures. Use the appropriate title and alternate text (alt image) to an image can make our images become more SEO friendly. Which should be understood by bloggers is that the search engines (google, bing, yahoo, etc) using the information on the image (including title tags, alt, file names, and so on) to deliver the best search results to users search engine. Therefore, the ALT and title attribute are very influential in Onpage SEO value. In addition, by adding the ALT and title attribute automatically will simplify and accelerate us in writting article, especially in wallpapers site. This post is a continuation of my previous article Easily Add Title and Nofollow Rel for WordPress link, make sure you have read it. Restore Image Title automatically adds the title attribute on the wordpress image when we add the media image into the post, because wordpress does not fully support the addition image title automatically. When we add new media image from post menu , The ALT option will be filled with your image name.